For this adventure, we are tackling a subject which we have actually never done: FOOTBALL. It's hard to believe in the almost 200 episodes we've been fortunate to make, we've yet to actually do an episode covering this American tradition. Football is one of the most popular sports and we wanted to prepare you for Super Bowl 53 by discussing the 2006 film, Girdiron Gang. Our resident movie man, Dan Rockwood, joins us for this one. Thanks to Mill Creek Entertainment for making this episode possible. To pick up a copy of the movie, you can click here. 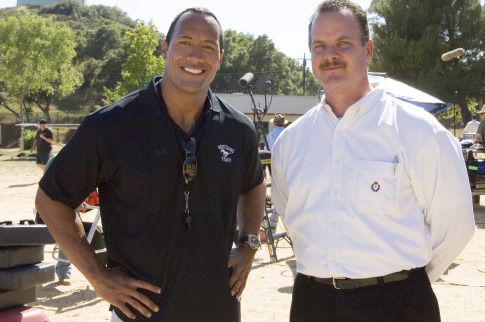 Dwayne Johnson plays Sean Porter, a gentlemen who works at a corrections faculty. Porter has a desire to break the cycle of violence within the kids that come through his prison. In an attempt to turn around the cycle, he aims to take this kids and turn them into a full-fledged football team. Gang chronicles the true story of how this group of troubled misfits actually ended up breaking down rivalries and crafted a family among these teens. It’s an incredible story that makes up the course of the film. Sports films are a dime a dozen. Some truly stand the test of time and ultimately become as iconic as their source material. Films like Field of Dreams, Rocky, Remember the Titans and Jerry McGuire just to name a few. Dwayne Johnson is one of the biggest stars in Hollywood at the moment. Starring in this amazing true story which really does showcase that one man can really make a difference. How the impact of working hard and never giving up - how that truth can really hit hard and make the difference. This very fact is the reason we produce the content we do, please. If you need the hope or help, please reach out. Music by Logan McElroy and Shawn Davis. The X-Files are property of Fox. We do not own nor claim any rights. The Flash & Man of Steel are property of Warner Brothers & DC Comics. We do not own nor claim any rights. Super Smash Bros is property of Nintendo. We do not own nor claim any rights. Networked by That's Entertainment! Gridiron Gang is property of Sony & Mill Creek Entertainment. We do not own nor claim any rights.